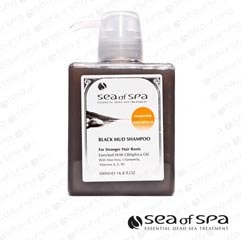 Quick Overview The Black Mud Shampoo by Sea of Spa is a unique shampoo for all hair types. The Shampoo enriched with natural Dead Sea minerals and vitamins that are essential for keeping the hair and scalp healthy, and also enriched with Obliphica oil, which is known for its healthful properties for restoring and improving hair appearance. The shampoo contains pure Dead Sea mud which helps to resolve scalp and hair problems and effectively strengthens the roots, leaving the hair feeling soft and silky smooth. Directions for use: massage a generous amount of shampoo throughout the hair. then rinse thoroughly. Recommended for a daily use or as needed.